Online or by phone (877.987.6487 with a $1.50 fee per ticket). Additional fees apply. You know that feeling when someone asks “How are you?” and you say “fine”—even when you’re dying inside—so everyone can go about their day? “Terrible, Thanks for Asking” is the opposite. Hosted by author and notable widow (her words) Nora McInerny, the podcast features real stories of love, grief, and pain that are sometimes sad, sometimes funny, and always human. 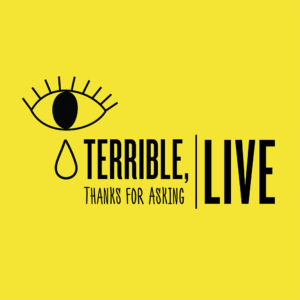 Terrible, Thanks for Asking LIVE is a theatrical presentation of the podcast with live music and multimedia storytelling of an unpublished episode. Live narration from Nora, audio clips, and beautiful, bold visuals bring the audience through the signature “Terrible, Thanks for Asking” emotional journey. Nora will also present a selection from her newest book, No Happy Endings.